Drew Brees hasn’t quite been himself the past two games after starting the season on a record-setting pace for the best PFF grade. That’s most likely not in play at this point, as he once again struggled for most of the game fumbling in the pocket and throwing an interception on a screen play. The offense started clicking in the second half, but Brees still didn’t litter the field with big-time throws like he has been most of the year. When in doubt, throw it to Michael Thomas who returned to his early season form with double-digit receptions for the first time since Week 9 and just the second time since Week 3. He had 11 catches on 13 targets with six of the catches going for a first down. The Buccaneer defense couldn’t have played any better in the first half, as they didn’t miss a single tackle. It was a different story in the second half, as they hit double digits in missed tackles. The defense struggled to tackle in the run game against Mark Ingram and Alvin Kamara. The defensive core of Gerald McCoy and Lavonte David both played well against the Saints, as McCoy was disruptive in the run game while adding in multiple pressures and David was one of the better coverage defenders for Tampa Bay. Unfortunately for the Buccaneers, the pieces around them didn’t put forth consistent efforts. Starting cornerbacks Ryan Smith and Brent Grimes both turned in below average games in coverage. 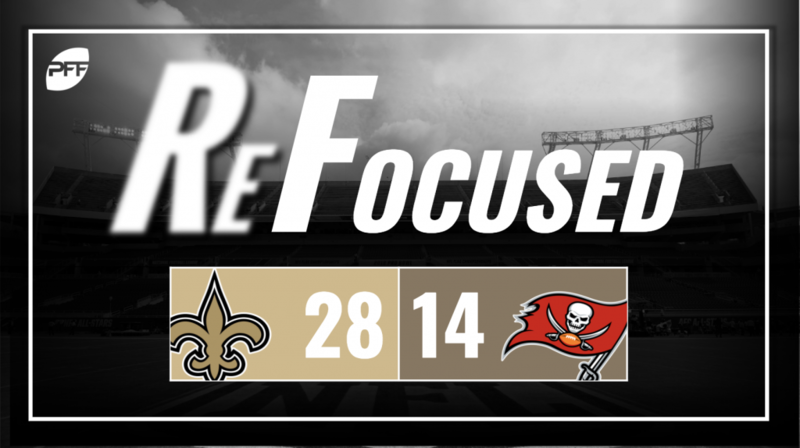 Brees and company finally got it going in the second half, aided by some key special teams plays. The Bucs couldn’t generate enough big plays to move the ball and get in the end zone. The missed field goals left them with no points on two occasions.